Wheatgrass, scientifically known as Triticum aestivum is an all in one natural supplement which is beneficial for your skin, hair and health. For all those who are looking for something that helps in reducing their weight, achieve a flawless skin, and have a healthy hair, this might be one ideal natural supplement that you need to add to your diet. Wheatgrass is not something that is newly known to mankind. In fact, it was used by the early Egyptian civilisation as something that helps in health care, and also as a beauty aid in the ancient times. It was Charles Schnabel, an agricultural chemist from Kansas, who discovered the healing properties of wheatgrass. But wheat grass became more popular in the mid 1900s, when Ann Wigmore, a Lithuanian heat expert explained in her book ‘The Wheatgrass’ the amazing benefits of the wheatgrass juice. If you are late to know about the benefits of this amazing natural supplement, this article would help you in knowing more about this amazing juice. If your skin is prone to acne, then drinking wheatgrass juice daily might help you. Daily intake of this juice helps in removing scars and blemishes, and is also good for acne prone skin. To cure many skin problems, you can also use this juice externally too. To treat blemishes on the skin, you can use a wheatgrass ice cube on affected areas. To make this, just freeze some wheatgrass juice in an ice tray. Wheat grass juice can also be used as a body cleanser. Just add a glass of wheatgrass juice to the bathing water and soak yourself in it. Using it in a bath tub would be more effective. Soak yourself for at least half an hour. Doing this as a practice will help you get rid of body odour. It will also cleanse your body well and is found to be good for sunburned skin too. Wheatgrass juice is rich in vitamins. It also contains a lot of flavanoid, a natural photochemical which acts as a good antioxidant. Antioxidants are something that helps in slowing down the aging process. 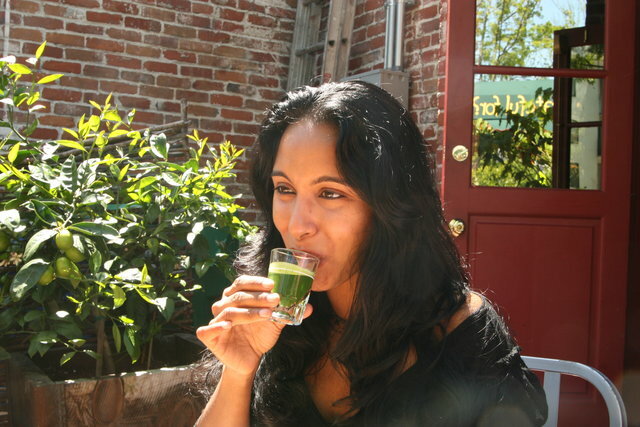 Thus drinking wheatgrass juice will help you in looking young. Wheatgrass juice also helps in detoxifying your body. By detoxifying, it enhances our natural health, and makes your skin glow. It is also identified that wheatgrass juice can also be used to cure skin diseases like eczema and psoriasis. Because of its good cleansing properties, wheatgrass juice can help in removing dead skin from your scalp. All you need to do is just rub some wheatgrass juice on your scalp. Allow it to stay there for 20 minutes and then wash it off using shampoo. Removing dead skin from the scalp will help in promoting hair growth. Using wheatgrass juice can also bring more sheen to your hair. It can also be used to treat other hair problems such as hair fall, hair damage, premature hair greying, and dandruff. What makes this more special is that, it works equally well with dry hair too. Thus, wheatgrass juice is an all in one solution to all your hair problems. Wheatgrass nutrition is a powerhouse of nutrition. 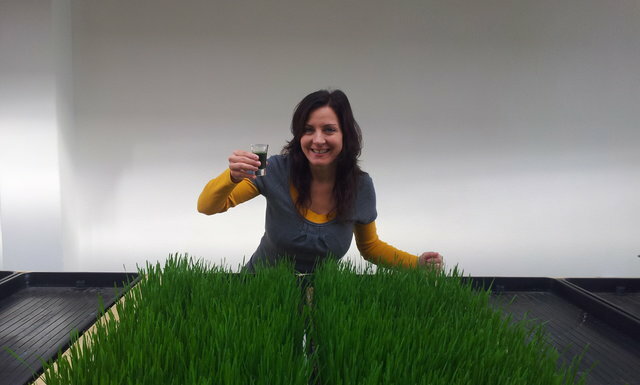 One glass of wheatgrass juice is packed with vitamins, amino acid, and chlorophyll and liver enzymes. Out of the 102 earth elements that you find in the soil, wheatgrass juice contains 98 of them in it. This juice has more amount of vitamin A and C compared to oranges and carrots. The main minerals that we find in wheat grass juice are phosphorus, calcium, iron, magnesium and potassium. These are the important minerals that we find in wheatgrass juice, out of the total 98 minerals in it. Wheat grass is also exceptionally rich in other vitamins such as vitamin E, K and B. all this makes this amazing juice something that health experts recommend as dietary supplement. If your heavy body weight is what that concerns you, wheatgrass juice can help you in a very effective way. Many of you might not like the taste of this grassy concoction, but having a daily shot of this juice will help you lose weight in many ways. Drinking wheatgrass juice will help in removing harmful toxins from your body. Removing toxins from the body is the first step in losing weight. Removing toxins will also help in managing thyroid gland, which slows down the metabolism that causes weight gain. Wheat grass juice is also rich in potassium that helps in burning calories effectively. Because of its high nutritional value, having a glass of wheat grass juice will help in checking your craving for food, and also keeps you away from feeling hungry often. Wheatgrass juice helps our body to build up red blood cells, which supplies oxygen to the body. It thus decreases carbon monoxide in our body which in turn prevents chance for cancer. The enzymes in wheatgrass juice helps in dissolving tumours. The rich protein content of this juice helps in building muscle tissues, repair cells and clot blood. The vitamin C in this juice makes it good for your eye. Regular intake of this juice also reduces acidity levels in body and prevents problems such as constipation, ulcers, diarrhoea etc. Because of the high protein and enzyme content, a glass of wheatgrass juice can increase your energy levels better than a glass of any other drink. Wheatgrass juice is also rich in chlorophyll content. Chlorophyll is helpful in fighting harmful bacteria in our body, and is also helpful in building our immune system. A glass of wheatgrass juice will contain almost 70 percent of chlorophyll. This rich chlorophyll content helps in protecting your internal organs, especially your lungs from pollution, smoking and heavy metals. Hence daily consumption of wheatgrass juice will keep you free from all kinds of illnesses.